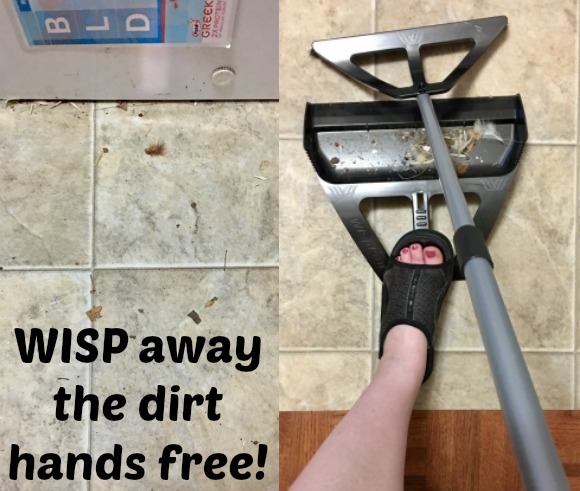 Stacy Tilton Reviews: WISP away the dirt hands free! WISP away the dirt hands free! If you're like many of us out there sweeping is probably not one of your favorite tasks. I know for me using a broom is was always my last resort. That was up until I was introduced to The WISP One-Handed Broom. I thought for sure it was going to be another one of those as seen on TV products that was too good to be true. You know the kind that end up in the donation box a few days after it arrives because you're fed up trying to use it the way it shows on the commercials. However The WISP actually turned out to be a "for real" thing! It really does clean up messes quickly and easily with just the swipe of the broom. The photo on the left is of my floor before using The WISP on it. The photo on the right is what it looked like after I took the broom over the entire area. I honestly only did one stroke over each of the tile squares starting from the freezer and going back to where I was standing. And I did this all while holding the dustpan with my foot..yes my foot. I didn't even have to bend down to hold the dustpan to scoop up the dirt. 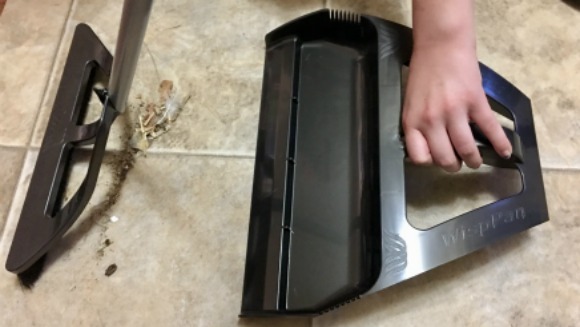 Just to show you though yes you can use your hand with the dustpan if you prefer. This is nice too if you sweep everything in one pile and then want to scoop it up. But honestly either way works just as well as the other. There are actually three different WISP products in the line that you can choose from depending on what size clean-ups you usually face at home. I'm super happy with my WISPsystem and miniWISP that I received and have found myself using them quite often. The miniWISP is great for small messes when you don't need a full sized broom.